You move fast. Your power supply should keep up. It's that simple! This portable USB wall charger sets the pace with Qualcomm Quick Charge capability, compatible with all USB-charging devices. Let's speed this up! Utilizes Qualcomm® Quick Charge™ 3.0 charging port, giving you up to 3.0A of charging power. 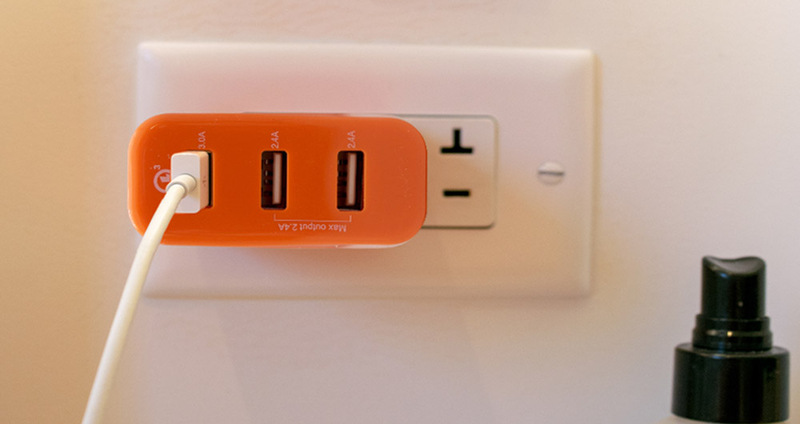 Also includes 2 standard USB ports so you can charge up to 3 devices at once. Much power. Tiny footprint. Power up multiple devices without taking up too much space. You've got the power: (1) QC3.0 USB-A + (2) USB-A accommodates all portable devices, such as phones, tablets and other mobile electronics. Orange may be the new black, but it's also hard to forget. Bright-colored housing prevents leave-behinds. 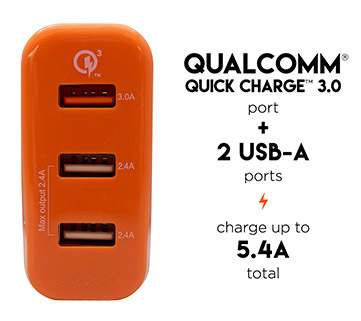 Charge up to 3 devices at once, and 1 port is Qualcomm 3.0 Quick Charge compatible. and if they hate then let 'em hate and watch your devices charge up"
We ran some serious calculations and determined that three charging ports is better than one. Especially when one of those ports is Qualcomm Quick Charge 3.0 compatible. Even if you have a Samsung Galaxy that can only handle up to Quick Charge 2.0, this charger will future proof your next phone. We all know someone's phone is falling into the lake this year and it definitely won't be mine. There are also 2 standard USB-A ports to plug your iPhone X, iPad, or another USB device into. No more fighting over the one power adapter, now you and your beloved can charge in harmony. You can thank Echogear at your wedding. Send us pics. If you don't take pictures on your vacation did it really happen? That'll drain your battery pretty quick. 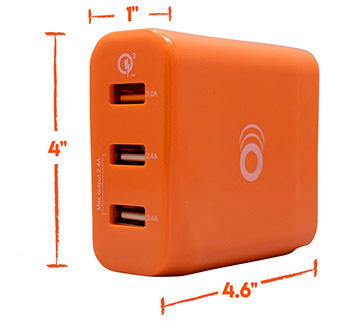 This charger is packed with features making it the ideal travel companion. First off, the plugs fold in for easy storage and to keep everything else inside your bag safe. Nothing like a deep screen scratch to complement your new case. Folding the plugs in will help eliminate that. Yes, it's orange. And yes, there's a reason. Hotel housekeepers must be flush with electronics because we're always forgetting things. This charger stands out in a crowd so you won't leave it behind. Good luck overlooking it when you wake up 5 minutes before checkout. 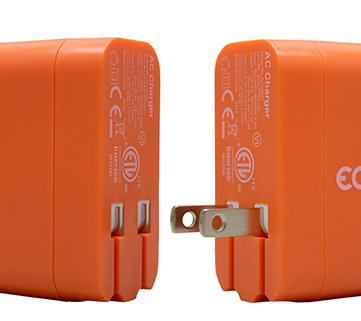 It is designed to be compact, while still delivering up to 5.4A of total power. Charging 3 devices in one outlet means this charger will be a little bigger, but we kept it as small as possible to keep your carry-on organized. It's the last travel phone charger you'll need. What are you waiting for? Grab this before your next trip. Click the button below to add the Qualcomm Quick Charge USB Wall Charger to your wish list.